Over the past few months we at In Mind Cloud have received many queries on how our Cloud CPQ Express solution is specialized for Discrete Manufacturing industries. Customers want to know how it provides CPQ (Configure, Price, and Quote) functionality in SAP Hybris Cloud for Customer (C4C) and how well our solution is integrated. In this blog post I will provide you with in-depth development details and the game-changing customer requirements that led to our solution. I will also address the needs and challenges of SAP customers when moving on to a cloud-based CPQ solution. What Use Case Does the Cloud CPQ Express Add-On Address? The Opportunity-to-Order sales process has multiple touch points and data flowing in from various systems. For a non-CPQ-system this is addressed very well by a SAP Hybris Cloud for Customer (C4C) and SAP ERP combination. But if a customer wants to use configurable products with product master, price and knowledge base data pulled from SAP ERP in real time, multiple challenges arise, ranging from process orchestration to data consistency. How Does Cloud CPQ Express Tackle These Challenges? Cloud CPQ Express addresses this problem in the most SAP-centric way: first, by integrating with SAp Hybris Cloud for Customer on an Internal Quote level, so that the customer won’t feel any disruption in the Opportunity-to-Quote process. A Quote created in SAP C4C will be imported into Cloud CPQ Express and can be configured, priced and exported from there. More so, this integration is presented in an embedded view so that sales users don't even realize they are using a solution outside SAP C4C. Watch our latest demo video to see how well our CPQ blends in to SAP Hybris Cloud for Customer. SAP C4C and Cloud CPQ Express work together on a web-service-based integration. Just by setting up communication arrangements and enabling integration relevant web services, the system is ready for use within a few days. This integration is kept as simple as possible so customers do not have to extend their existing or new SAP C4C installations via SDK (Software Development Kit) coding. The Single Sign On problem is well addressed by usage of SAP Cloud Identity Service which provides simple and secure access to both SAP C4C and Cloud CPQ Express. Most of SAP's CPQ customers like to use condition type-based SAP pricing on cloud with real-time updates in the pricing engine, based on changes in the configuration engine. This is a hard nut to crack in cloud because of two reasons. There is no engine except SAP SSC (Solution Sales Configuration) that does this outside of the SAP Kernel. For the SAP SSC to run on cloud it needs to have access to this data in real time as it had in the old IPC scenario, in a scalable and performant manner. Couple this with data coming from SAP Hybris Cloud for Customer such as Account, Sales Area and ERP Product ID, all of which is crucial to determine the price context. This is just the gist of the problem. There are several deep rooted touch points that need to be addressed and are beyond the scope of this write-up. One can visualize the challenge in the above scenario and why various partner solutions fulfill one part of it, but none offers a complete solution. Having said that, the development journey for us was also long and indeed an intensive one. 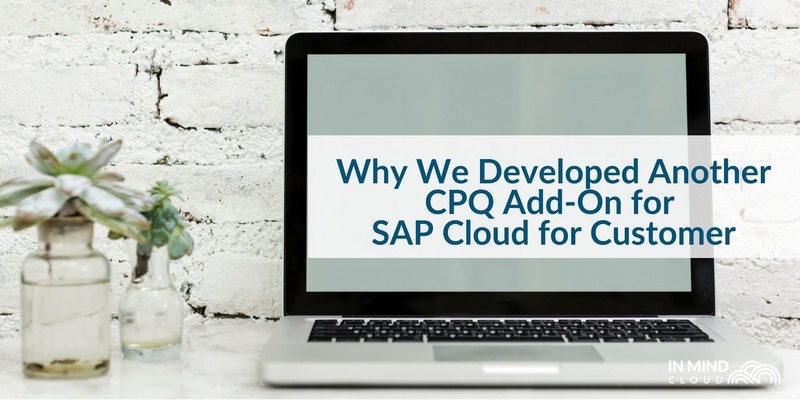 With Cloud CPQ Express SAP customers would now be able to run SAP Pricing and Configuration using Price Data and Product Knowledgebase from ERP in the cloud respectively. Something, we at In Mind Cloud are proud to offer. This is probably 80% of the feature set. The remaining 20% is what matters even more to our customers in Manufacturing and High-Tech industries. They have specific needs and made investments into legacy systems which they want to leverage. Let’s look into some of the most relevant additional features that SAP customers request from a CPQ solution. Customers already thought about these cross- and up-selling concepts and have actually built those deeply into their product models. There was no standard software to run such concepts. A sales rep is configuring a product. While doing so, he would like to set certain options that he wants to offer to the customer as an up-selling opportunity. He does not want them to be part of the quote offer yet. Hence, it should also not be part of price calculations but offered additionally. These up-selling options could be additional product features or complimentary products/parts which have a price impact. In this real-life example you can see that the sales rep selects two complimentary parts to include them in the proposal: Secondary Light and Power Wheels. They are excluded from the total price but presented as options in the proposal. Cloud CPQ Express calls these Additional Options and any price relevant characteristics (product configuration options) can be viewed as additional items to be selected at a click. This works on top of SAP Configuration and Pricing engine and provides a meaningful view to these up-selling options even before they are selected. Secondly, the ability of Cloud CPQ Express to quote products optionally means choosing to exclude a certain line item from your quote - not by deleting. Again this is a feature which customers in EMEA and particularly in D-A-CH region use extensively. They either aim to offer some products that customers can choose additionally, or even quote a product that is yet to be offered. Another use case is to simply record a customer request that they will fulfill later and do not want to ignore in quotation process. In this example the sales rep excludes the Maintenance Contract to match the pricing requirements but keeps it in the quote to up-sell this option to the customer at a later point. With our solution they are able to do all of this and more in a standardized SAP-controlled way on SAP Cloud Platform. All of those together bring completion to a standard quotation process supporting CPQ solution, which is made available inside a SAP Hybris Cloud for Customer driven CRM process. We continuously enhance our feature pack to increase usability and add value for our customers. You are welcome to learn more about our product here or find it in the SAP App Center. I am happy to answer any process-based, technical or general questions about the product in the comments! For more recent updates about our product, check out our release news. Dhaval is In Mind Cloud´s Senior Vice President Product Engineering. He writes about latest product developments and gives technology insights into our cloud portfolio.